(Photo: Ecumenical News / Peter Kenny)Anglican priest Father Michael Lapspley speaks about his book Redeeming the Past: My Journey from Freedom Fighter to Healer during the World Council of Churches 10th Assembly on November 6, 2013. BUSAN, South Korea - When Nelson Mandela walked free from jail in February 1990, millions celebrated the symbolic end of the hated system of apartheid with the expectation of peace. Yet three months after Mandela's release, an Anglican priest, who had spent most of his adult life working against the racist system in South Africa, had both his hands blown off. He also lost one eye after a parcel bomb exploded in his hands in Zimbabwe, at a time when all the strife could have been ending. 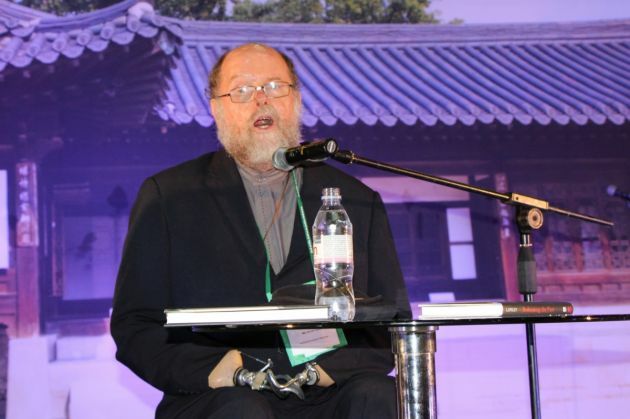 Anglican priest Michael Lapsley was that man and people were queuing up for his book Redeeming the Past: My Journey from Freedom Fighter to Healer, published by the World Council of Churches during its October 30 to November 8, Assembly in Busan, South Korea. Lapsley also preached during the final service of the gathering that brought some 5,000 people from all around the world to South Korea's second city to assess and plan the journey for the ecumenical grouping that represents some 560 million Christians. In the Sending Service on Friday, Lapsley said, "My dear Sisters and Brothers, I often ask myself: 'Why did you survive a bomb that was supposed to kill you?' So many others deserved to live but did not. "I think it was important that some of us survived to bear witness to what war and hatred does to the bodies and souls of people. "Much more importantly, I hope that in my own tiny way, I can be a sign that stronger than evil and hatred and death are the forces of justice, kindness, gentleness and compassion - of peace - of life - of God," said Father Michael. It was 20 years ago that Lapsley received a letter bomb from the apartheid security forces that blew off his hands, destroyed one of his eyes and an eardrum, leaving him badly burnt. His book "Redeeming the Past: My Journey from Freedom Fighter to Healer" chronicles his experiences since the bombing. During a question and answer time and book signing at the World Council of Churches 10th Assembly this week, Lapsley spoke candidly to the audience regarding his personal healing process. "My participation as a chaplain and priest in the liberation movement had prepared me for the possibility of death. What it had not prepared me for was the possibility of permanent major physical disabilities," said Lapsley. Lapsley came to South Africa from New Zealand in 1973, and was shocked when he saw the level of discrimination and racial oppression in the country. Later he joined the then outlawed African National Congress, which now rules South Africa, and he became a chaplain to the ANC, but had to leave the country. Today, Father Michael heads the Institute for the Healing of Memories. This facilitates the healing process of individuals and communities in South Africa and internationally. It says of itself that it redeems the past, "by celebrating that which is life-giving, and laying to rest that which is destructive". "It seemed to me that we would not create a very nice society if we were filled with hate and bitterness," Lapsley told the book signing audience about his reason for founding the Institute for the Healing of Memories. "If horrible things happen to us we've got good reasons to hate, we've got good reasons to be bitter, we've got good reason to want revenge. But if we keep that stuff in us, it doesn't destroy our enemies, it destroys us." During the question and answer period following Lapsley's short address, one audience member asked if he had personally reconciled with his attackers. Lapsley responded, "As I sit here tonight, I don't know who made the bomb. I don't know who gave the instructions. I don't know who wrote my name on the envelope. "Sometimes when I speak people say oh Father, you're a wonderful example of forgiveness. I say, but I didn't mention the word forgiveness. I said I'm not full of hatred, I'm not bitter, I don't want revenge but I haven't forgiven anybody because for me there is nobody yet to forgive." "In our healing of memories workshops in South Africa, the question that people raise most frequently and something they struggle with is forgiveness. "For most human beings forgiveness is costly, it's painful, it's difficult. In our faith tradition we speak of grace. Often it's so big, we need the power of God even to want to want to forgive." Lapsley's closing remarks were a call to the Church to stand alongside victims. "If I can say something tough, sometimes in the Church we use forgiveness as a weapon against hurting people... People have to have their pain acknowledged before they can begin to travel the journey of forgiveness." "Also, forgiveness is messy. I forgive you today but I'm not sure about tomorrow."